This high temperature, heat resistant and radiant heat reflective sleeve forming tape can be used to protect industrial wires, cables, hoses (hydraulics), piping and tubing from radiant heat sources such as glowing steel slab, liquid metal pour stream, infrared heaters and other similar sources. 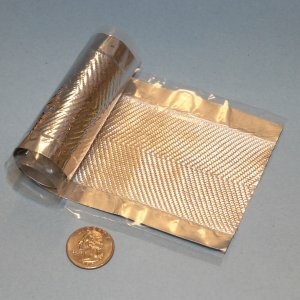 This aluminized PET film coated fiberglass sleeve is easily wrapped over wires, cables and hoses and then closed with the adhesive edge strips. It can be used longitudinally or spiral wrapped down the length of the wire, cable or hose. This sleeve is used extensively for automotive, construction equipment, mining and truck under-hood engine compartment applications.